Taxes and death. The two things in life we can’t escape. 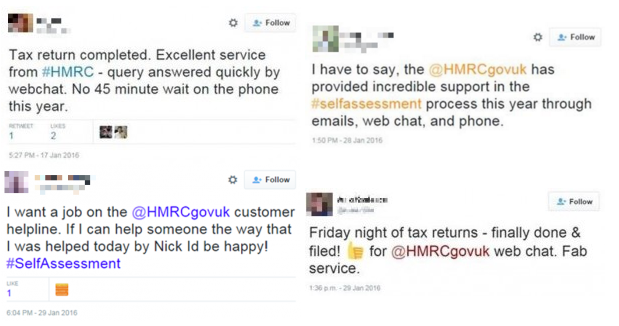 So what on god’s green earth could ever compel someone to tweet positive comments about a tax self assessment process? Well, let me explain. HM Revenue & Customs, the UK’s tax body, has been a leading agency in the government’s digital transformation programme. The aim of which is “building digital services that are simpler, clearer and faster to use”. It’s fair to say that tax services in the UK, were not widely regarded as being simple, clear or fast. To create the underlying infrastructure that could power that transformation, HMRC, with its partner Equal Experts, built a network of microservices that use MongoDB’s scalability, data model flexibility and ease of development. This project also ushered in a move to agile development and a default preference for open source technology, like Docker containers. How many times have you seen someone tweet their affection for a tax service, right after filling out a self assessment? The Digital Transformation director also looked at how the Multi-channel Digital Tax Platform or MDTP had facilitated these dramatic changes. He explained that “[MDTP] hosts the digital tax accounts at the heart of our digital future, plus all of our new online services”. MDTP has launched 28 services, handled 55 million visits and, get this, saved £8.5 million in operating costs. That’s right, the services are vastly improved and the tax papers seeing savings in excess of, for our American friends, $12 million USD. These impressive numbers are the result of many people doing incredible work. One part of that is the microservice architecture that supports HMRC’s digital transformation. With the help of partner Equal Experts, HMRC has used modern technologies such as MongoDB and Docker to make services more agile, flexible and scalable. Before the microservices transformation, HMRC were pushing two releases a year. Now it’s 50 releases a week. Simple, clear and fast. And it saves the taxpayers millions. Digital transformation at HMRC is a demonstration of what’s possible when people take a completely new look at how to solve a problem. As Ben Franklin said: we’ll never escape tax or death. But it’s a relief to know at least one of life’s constants is getting a little less painful.